Those who live in the Philippines know that April is when you normally plan for a vacation to escape the summer heat. Bright sunshine, cloudless skies and temperatures in the mid-thirties Celsius are more characteristic of the April than having weather disturbances in the neighbourhood. An announcement from the Philippine Atmospheric, Geophysical and Astronomical Services Administration (PAGASA) that a tropical disturbance that recently spawned in the Western Pacific was heading for the country, therefore, raised not just a few eyebrows. Tropical Depression ‘Domeng’ – international code name ‘Peipah’ – entered the so-called Philippine Area of Responsibility (PAR) Sunday afternoon as an off-season storm. Weather disturbances are more likely to occur in the Western Pacific from June to November and the frequency of their occurrence taper down starting December. However, the PAGASA spokesman in the news item last night was careful to say that it is not known as yet if the location of Domeng’s formation has anything to do with climate change. The end-of-year howlers, as everyone here in the country now knows all too well, rather tend to be the ones that leave behind significant damage. Note Yolanda (Haiyan) and Pablo (Bopha). January to May, in a manner of speaking, can thus be regarded as off-season for these tropical disturbances as far as the Philippines are concerned. That said, these storms do occur year-round and can spawn even in the so-called off-season. An April storm, therefore, is not something entirely unheard of. Naturally, the frequency of occurrence is not as high as during the months of June or July. From 1984 to the present, the Philippines have been visited by only 16 weather disturbances in the month of April. It is worth noting, however, that historical and statistical data show that the Philippines are even less likely to get hit by a Western Pacific storm in February than the month of April. Still, Domeng is something of a landmark weather disturbance according to PAGASA in an interview aired over the primetime news last night, not so much that it is an April storm but more in the location where it spawned. Warm sea surface temperature, air instability and humidity are all basic ingredients for weather disturbances to spawn. Ocean temperatures of at least 26.5ºC reaching down 50 metres are normally the minimum required for their formation. What makes Domeng unusual, PAGASA said, was that it spawned at 1.9º Latitude, the first on record to form below 2º Latitude. This means that Domeng is the weather disturbance on record that has formed closest to the equator. Normally, weather disturbances in the Western Pacific form at least 500 kilometres from the equator. Latitude 1.9º is roughly 211 kilometres from the equator, not even halfway close to the normal minimum distance where these disturbances form. This may not be of utter significance to the man on the street, but may nonetheless be portentous of changing weather patterns. As of this morning, Domeng has slowed down and has been downgraded from Tropical Storm to Tropical Depression. 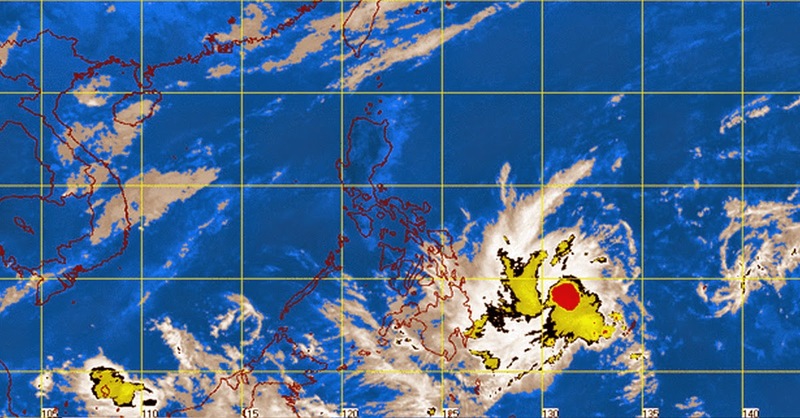 It is expected to make landfall somewhere over the Surigao area and cross the Visayas before leaving the PAR through the West Philippine Sea. 1. Top Photo from PAGASA.